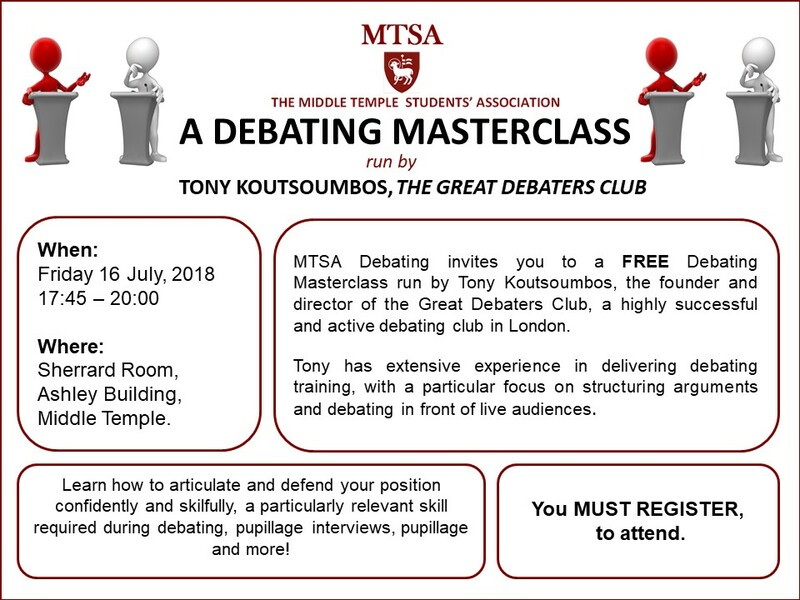 MTSA Debating invites you to an interactive workshop where you can learn various techniques to refine your arguments concisely and effectively. There will also be an opportunity for a mock debate, enabling you to polish and refresh your debating skills. Refreshments will be available, and registration is not required. You MUST register to attend. This is a FREE event. YOU MUST BOOK A TICKET TO BE ABLE TO ATTEND. Student Members of the Inn can buy tickets online by clicking ‘Add to Cart’. Please note that you must log in to book (if you have not yet created a log-in please register first). Alternatively you can buy tickets from the Treasury Office in person or by telephoning 020 7427 4800. Unless the event sells out earlier, booking will close at 17:30 on 6 July 2018.